MADness in Everett - UPDATE! Or maybe I should call this an Oops-date: The organizer of todays anti-immigrant forum in Everett is accused of having sticky fingers! A candidate for Everett City Council and active foe of illegal immigration was charged with theft after walking from a Quality Food Center (QFC) into an adjoining Starbucks with unpaid merchandise in hand. ... Forde was charged with theft, according to court documents. She has pleaded not guilty. It's not on a par with questions being asked Jim Gilchrist about $750,000 missing from Minuteman Project accounts, but it's a start... Way to go MAD woman Shawna Forde! Owning businesses is fine. Controlling what people get to know, isn't. NEW YORK Tonight's edition of Bill Moyers' Journal on PBS contains a stinging criticism of Rupert Murdoch by the show's host, who uses the pending sale of Dow Jones & Co. to Murdoch as an excuse to point out what he deems are the News Corp. chairman's worst traits. "If Rupert Murdoch were the Angel Gabriel, you still wouldn't want him owning the sun, the moon and the stars," Moyers starts his video essay. "That's too much prime real estate for even the pure in heart. A Bill Moyers essay on Rupert Murdoch and The Wall Street Journal. The Everett Herald has some very creepy news; Minuteman Project founder (and suspected embezzler) Jim Gilchrist "won't mince words when he's in Everett on Saturday"... but we're not told if he'll be chopping, dicing, grinding, mashing or pureeing the truth as "keynote speaker at the Illegal Immigration Summit". This "Summit" is sponsored by something called "the Reagan Wing" and a MAD woman named Shawna Forde who's trying to take her insanity to the Everett City Council. Naturally, as with all the other 'Nativist Extremist' Groups, Jim Gilchrist and his hosts will quack, quack, quack that they aren't racists. But the truth is that they get all of their rhetoric, their conspiracy theories, their rumors, their "intel" straight from white-supremacist websites... and they attract white-supremacists to their events in exactly the same way that horseshit attracts flies. This $30 a head scam-o-rama will feature local race-baiting Republican candidates; Doug Roulstone retread WA-02 congressional candidate (here's a hint Doug; it's not golf, you're not supposed to be trying for a lower score than last time around.). 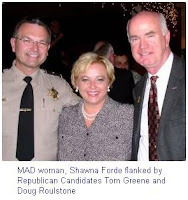 Also on the bill is Snohomish County sheriff candidate Tom Greene ( What the heck, it's been a whole decade since Snohomish County had a sheriff connected to violent extremists ). And of course candidate for Everett City Council Shawna Forde, with the delusion that people are "oppressed by mob rule and liberal political pressures". Yes indeedy, the demagogues, the delusionals and the just plain paranoid will be gathering in Everett on Saturday for a big ol' round of scapegoating. Slow but steady wins the race? But what can be done to stop the ongoing harm that Bush/Republicans are doing? The Neo-Con/Conservative/wing-nuts are still busily babbling about their Islamofantasy world. They are making every effort to force the world into the mold of their bizarro fantasies. Not only are they willing to continue disastrous tactics in an effort to stave off admitting that their policies are faulty and that the occupation of Iraq is a failure; they are prepared to diminish Americas standing in the world by implement policies that decimate our military while build up our enemies. Employees of Private Security Companies or Private Contract Forces, those are the terms now. In the news, in 2004, they were "contractors". But whatever you call them, we're not hearing much about them. Exactly how many Americans are serving in Iraq and what they are doing there might not seem complicated questions. Stories in the media regularly talk about the 150,000 U.S. military personnel in the Iraq theater. Coverage of events inside Iraq, which includes the actions of U.S. troops there, was the third-biggest news story in the U.S. media for the first quarter of 2007, according to PEJ research. But those numbers do not include coverage of some 30,000 employees of U.S. and European-based Private Security Companies (PSCs), who work in some of Iraq's most dangerous areas. Private Contract Forces(? ); Thirty thousand armed foreigners operating in Iraq! That's the size of the Bush/Republican 'Surge'! British troops have recently been reduced from 7000 to 5500. We don't know who these "Private Contract Forces" are or who they're working for. It's not because the public isn't interested. A PEW survey shows that news coverage on Iraq lags far behind public interest. All of the protests might make Alberto uncomfortable, but as they say; 'there's no rest for the wicked'. ... Early Wednesday, a handful of protesters gathered outside the Westin Hotel in downtown Seattle before Gonzales' scheduled speech. Wearing masks and black and white striped uniforms, they are depicting administration officials as criminals. Gonzales is speaking to an invited audience of technology executives with the group TechNet Northwest about intellectual property rights and cyber crime. David Postman of the Seattle Times is on his way to Spokane for Alberto's "one Washington state media availability". UPDATE: I missed this earlier; Dan at On The Road To 2008 has a first hand account of Alberto's slippery moves in Seattle. WASHINGTON — Senate Republicans on Tuesday blocked a bill that would allow labor unions to organize workplaces without a secret ballot election. Democrats were unable to get the 60 votes needed to force consideration of the Employee Free Choice Act, ending organized labor’s chance to win its top legislative priority from Congress. Washington State rates well in this report. Washington State Sen. Jeanne Kohl-Welles speaking at the Progressive States Network's first annual gala on April 19, 2007 at the Mott House in Washington, DC. I mentioned last week that Dino Rossi's travelling sideshow looked more like a political campaign than a public service... And clearly I'm not the only one who thinks something about it stinks. Hey... if it walks like a campaign and quacks like a campaign, it must be a campaign. SEATTLE – Washington State Democrats today asked the Public Disclosure Commission to investigate Dino Rossi’s non-profit "Forward Washington Foundation" (FWF). The tax-free entity, formed after Rossi’s 2004 gubernatorial loss to maintain his public presence for a potential future run, is now being used by Rossi as a vehicle to conduct the activities of his 2008 political campaign. Key Background: In December 2004, Dino Rossi officially became – and remains today – a declared candidate for governor in the 2008 election. After complying with reporting requirements for more than a year, Rossi 2008 abruptly stopped filing PDC reports, morphing operations into the non-profit Forward Washington Foundation less than a week after its February 2006 PDC filing. The Foundation’s non-profit 501(c)(4) status allows Rossi to solicit unlimited contributions in excess of campaign finance limits, while eliminating all transparency as to the source of Rossi’s money, because no disclosure requirement exists. In reality, Dino Rossi is conducting a political campaign: he is currently on a multi-stop, statewide "listening tour" on which he is appearing before crowds of local Republican activists, attacking the Governor and Democratic legislators, and seeking to garner local media coverage for his activities. In addition to financing Dino Rossi’s political travel and paying the salaries of former Rossi campaign political operatives, regulatory filings from his non-profit suggest that Dino Rossi has personally pocketed more than $100,000 from special interests he refuses to disclose for his "non-partisan" "non-profit" "work." "Dino Rossi is paying himself – with cash from special interests he refuses to disclose – to run a sham, tax-free organization to campaign for Governor," said Washington State Democratic Party Chair Dwight Pelz. "By using his phony non-profit to circumvent Washington state's campaign finance laws, Dino Rossi has eliminated all transparency and accountability as he continues his perpetual campaign for Governor." The House of Rep's passed H.CON.RES.21 by a voted of 411 to 2 . Title: Calling on the United Nations Security Council to charge Iranian leader Mahmoud Ahmadinejad with violating the 1948 Convention on the Prevention and Punishment of the Crime of Genocide and United Nations Charter because of his calls for the destruction of the State of Israel. But is it all based on a bad translation? Could this be the cloud of mushroom smoke that ends with guns? After Falafel Man, Bill-O criticized NBC for not reporting real news. Keith Olbermann shows exactly what Mr. O'Reilly thought were top stories for the past week. As usual, Jim Hightower is ahead of the pack when it comes to news and analysis about outsourcing. He sees all to clearly that when it comes to corporate authored globalization of trade, it isn't just low skill workers, but in the long run, it's all people who work for a living that will be the losers. Maybe you've noticed that America's call-center jobs are largely being outsourced to India. Well, you say, I'm more skilled than that, so I can't worry about it. Then you note that our accounting jobs, legal research, and architectural drafting work is being taken to India, too – but, hey, you do sophisticated stuff, so you can't sweat those losses. Lately though, you've also seen that our country's high-tech computer jobs are being shipped to India – and uh-oh, that's getting close to what you do. Still, you say, I'm a professional, by gollies, so I'm okay. ... It used to be "them" who had to worry about outsourcing. Now it's "us." Our politicians have got to quit pretending that this is not a problem – and start developing policies to revitalize American's middle-class. "India's Edge Goes Beyond Outsourcing," New York Times, April 4, 2007. Today India and China are on the upswing, but have no doubt that as average wages climb with their growing economies, international corporations are already looking to the next set of 'low wage' nations. As long as corporate lobbyists are writing the rules for "Free Trade", trans-national corporations will be the winners and the other six billion of us will be the losers. Conservative Republican (pinhead/dupes) are very fond of quoting (what they think) Ronald Reagan said about a rising tide lifting all boats. But instead of the that right-wing fantasy; the reality of, corporate written, Globalized trade rules, is that the yachts of the elite are being lifted while everyone else is being tossed overboard to tread water or drown. Juan Cole has some good advice for Hillary Clinton. ... The article, like many others, notes that at Hillary Clinton's speech at Take Back America, the Code Pink antiwar demonstrators were out in fewer numbers this time and that she got support from other parts of the crowd. The demonstrators objected when she blamed what went wrong in Iraq on the Iraqi government. They were right to protest. If I were advising Senator Clinton on what to say about Iraq, this would be it: "Our troops have fought courageously and with great skill against the totalitarian, genocidal Saddam Hussein regime and its security forces. They did their job, but the Bush administration did not do its. Bush failed to secure a United Nations Security Council resolution for the war, depriving the war effort of key international support and casting the administration as an outlaw regime in the eyes of much of the world. There was no planning for the aftermath of the war. Stupid decisions were taken to dissolve the Iraqi army, to fire thousands of experienced bureaucrats and teachers, to marginalize the Sunni Arab community, and to deliver Iraq into the hands of expatriate carpetbaggers, some of them overly friendly with the ayatollahs in Tehran. Neither the US military nor the Iraqis bear the primary blame for the subsequent catastrophe. It is on the shoulders of the Bush administration. The administration has so spoiled the situation that there is no longer any hope of a military solution. Any solution to this festering crisis must be political and diplomatic. The US military is essentially being ordered to support some sides in a multi-pronged civil war against others, but without any real hope of having being able to triumph decisively in these low-intensity guerrilla wars. That is why I favor getting our troops out of Iraq and insisting that regional powers, NATO and the UN now come in to bring about a political resolution, even as the world ensures that a nonsectarian Iraqi military is trained, equipped and deployed for the protection of all Iraqis." "What is this thing called 'blog'?" http://www.ourfuture.org/tba is the home of Take Back America. Video from the Gala Dinner at Take Back America 2007 in Washington, DC - June 19, 2007. The blogosphere's most famous unknown makes herself known, and accepts the Paul Wellstone Citizen Leadership Award on behalf of the entire progressive blogosphere. Dino Rossi is pretending to gather ideas from citizens as a cover for his perpetual Gubernatorial campaign. And Golly Gee, he's bringing his little sideshow to Bellingham tomorrow. 'Democracy for Washington' has a pretty good article comparing Dino Rossi's claims of being a moderate Republican with his actual State Senate record, HERE. Washington's Fort Lewis, the nation's third-largest Army post, has endured numerous losses from the Iraq war, many from Stryker brigades that patrol Baghdad. NewsHour correspondent Lee Hochberg reports on how the base is coping with the deaths. "LEE HOCHBERG, NewsHour Correspondent: Last month was the deadliest month of the war for Washington state's Fort Lewis, the nation's third-largest Army post. Twenty soldiers from the post lost their lives in Iraq. In June, there have already been 13 more deaths, 30 percent of all the U.S. military deaths in Iraq this month." "... had planned to leave the Army after this, his third combat tour." "... On his second deployment to Iraq, he was scheduled to have returned home, but his tour was extended." "... on his second tour of duty"
"... On his second deployment to Iraq"
It's always tragic to lose people in war, but it's doubly criminal when soldiers, having already fulfilled their duty, are sent back over and over again until they are killed in this Republican Party Act of Aggression. * As a result of the war, America is far more hated today throughout much of the world, especially the Mid-East, and is seen as a imperialist power. The Iraq invasion thus played directly into the hands of Islamic radicals like Osama bin Laden. * America’s own intelligence agencies concede that Iraq has become a giant factory for the minting of new terrorists, where almost none existed prior to the invasion. * Terrorist incidents worldwide have gone up seven-fold since, and largely because of, the invasion of Iraq. What is the 'Unitary Executive' doing about this terrible situation? Bush flew back to Washington aboard Air Force One later in the day. * To say that there was never a plan for the post-war occupation of Iraq is technically incorrect. There was an extensive plan which the State Department had put together, working with experts and Iraqi exiles. But Secretary of Defense Donald Rumsfeld didn’t want the State Department to have the credit and control for the occupation, so he and Bush threw State’s document in the garbage. Then there was no plan. * Most of the Americans sent to staff the Coalition Provisional Authority (CPA) had no technical or professional training or experience in the work to which they were assigned. Rather, they were chosen because they were Republican Party loyalists. * One of the most significant blunders the United States committed during the occupation was to dismiss the entire Iraqi Army, sending them home unemployed and armed, along with anyone associated with the Ba’ath Party, despite the fact that everyone who wanted to work at a professional level anywhere in Iraqi society had been forced under Saddam to join the Party. The first Chief Executive of the CPA, General Jay Garner, refused to purge all Ba’athists from Iraqi governing institutions, and instead sought to maximize Iraqi control of the post-war government as much as possible. He was quickly fired. As you can see the callous indifference of Bush and his Republican accomplice's is exceeded only by their gross incompetence. it was fun to chat with the Radical Cheerleaders when we went to the farmers market today. i am so inspired when i see the young people doing great things. thanks cheerleaders, you give me hope!!!!! ...."Although this may be the first time you've heard of us, radical cheerleading is not new to Bellingham. We've been around for years. Our squad is a mix of students, activists, radicals, Feminists and of course cheerleaders. For those of you who have never seen us cheer, radical cheerleading is a form of performance protest. What we do best is get people riled up at events. Most recently we performed at the Take Back the Night Rally at WWU. We led the march through downtown and back to campus. We also kicked off the 5K pro-choice run at Lake Padden. This event was put on by Naral and Pro-choice Washington. If you want to check us out we will be performing Saturday the 23rd of June at Seattle gay Pride. The Employee Free Choice Act has already passed in the House and now that it's coming to the floor of the Senate the Corporate/Republican/Right is absolutely hysterical about it, but also clinging to the hope that there won't be the 60 votes necessary for cloture. Sixty years ago this month, US labor law was dramatically altered in the interests of capital when the Republican-led 80th Congress passed the Taft-Hartley Act over intense opposition from organized labor. The legislation survived a veto by President Harry Truman, who described the act as a "slave-labor bill", arguing that it would "conflict with important principles of our democratic society." The amendments enacted in Taft-Hartley added a list of prohibited actions, or "unfair labor practices", on the part of unions to the National Labor Relations Act, which had previously existed to monitor abuses on the part of employers. The Act prohibited jurisdictional strikes, secondary boycotts and "common situs" picketing, closed shops, and monetary donations by unions to federal political campaigns. Union shops were heavily restricted, and states were allowed to pass "right-to-work" laws that outlawed union shops. Furthermore, the executive branch of the Federal government was empowered to break strikes if an action "imperiled the national health or safety," a test that has been interpreted broadly by the courts. * Establishing stronger penalties for violation of employee rights when workers seek to form a union and during first-contract negotiations. * Providing mediation and arbitration for first-contract disputes. * Allowing employees to form unions by signing cards authorizing union representation. The Employee Free Choice Act, supported by a bipartisan coalition in Congress, would level the playing field for workers and employers and foster economic growth for America's middle class. The following members of the U.S. House of Representatives and Senate are co-sponsoring the bill (H.R. 800, S. 1041) in the 110th Congress. Wednesday nite the Whatcom County Democrats held an endorsement meeting. Nearly a hundred local Democrats attended the meeting. Local candidates were asking for the Parties endorsement for the August 21st primary. For each candidate the question was asked: "does this candidate meet the criteria for endorsement and stand for the principles of our Platform to gain the endorsement of the Whatcom County Democrats?" A simple majority vote was required for endorsement and all candidates who received 50% plus 1 vote were endorsed. There were two other candidates in attendance who did not receive a majority vote and were not endorsed. 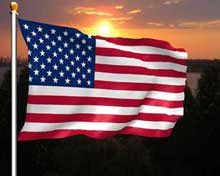 On June 14, 1777, the Continental Congress approved the design of a national flag. 68% of Americans think the country is on the wrong track, the lowest figure in 15 years. President Bush’s approval rating is at an all-time low of 29%. Over the last thirty plus years, billions of dollars have been poured into convincing Americans that this is a conservative country. Although that huge propaganda campaign had considerable success, conservatism has never been as prevalent as they'd have you believe. Now the tide has unquestionably turned toward a bigger and more vocal progressive majority. A report by the Campaign for America’s Future and Media Matters for America analyze a wide range of studies and surveys that show a growing majority of Americans take progressive stands on a full spectrum of issues. On Health Care: 69 percent of Americans think it is the responsibility of the federal government to make sure all Americans have access to health coverage; 76 percent find access to health care more important than maintaining the Bush tax cuts; three in five would be willing to have their own taxes increased to achieve universal coverage. On Energy Policy: 52 percent of Americans believe "the best way for the U.S. to reduce its reliance on foreign oil" is to "have the government invest in alternative energy sources"; 64 percent are willing to pay a higher energy tax to pay for renewable energy research; 68 percent of the public thinks U.S. energy policy is better solved by conservation than production. On the Economy: 77 percent of Americans believe Congress should increase the minimum wage; 66 percent believe "upper-income people" pay too little in taxes; 53 percent feel the Bush administration's tax cuts have failed because they have increased the deficit and caused cuts in government programs. On Government's Role: 69 percent of Americans believe the government "should care for those who can't care for themselves." Twice as many people (43 percent to 20 percent) want "government to provide many more services even if it means an increase in spending" as want government to provide fewer services "in order to reduce spending." On Immigration: 62 percent of Americans believe undocumented immigrants should be given a chance to "keep their jobs and eventually apply for legal status." 49 percent believe the best way to reduce illegal immigration from Mexico is to penalize employers, not more border control. Bellingham Herald Op-page Editor Scott Ayers followed up his Monday blog entry about Bellingham's shortage of Conservative candidates with a post that attempts to define conservative. Unfortunately, Scott seems to draw on conservative sources for his definition of conservative. Scott writes; "current conservative thought in our nation seems to be led by these tenets:"
(con-speak) -- Taxes are citizens' money and the government should take as little as possible. Current tax rates are too burdensome and should be cut, especially if it leads to a reduction in the size of government. (Plain English) - Talk of lower taxes is an excuse to dismantle the protective functions of government and stack the deck against ordinary citizens. (con-speak) -- Business growth and economic expansion are important to the future. A "rising tide lifts all boats." (Plain English) - A smoke screen to cover up cronyism; the use of government to protect certain favored business interests from any real competition. (con-speak) -- "Market-based" solutions are the answer to problems such as spiraling health care costs and potential Social Security insolvency. This is true locally with growth and environmental issues. (Plain English) - "Market-based solutions" is code for sabotaging democracy so that a select few can loot the nations treasury. The Financial Services Industry can't wait to dip into all those FICA withholdings. (con-speak) -- Win the "war on terror," including allowing law enforcement to use broad means defined in documents such as the USA Patriot Act as a way to sniff out those who might do harm to our country and citizens. (Plain English) - Put out a continuous drum-beat of Fear mongering to scare people into surrendering their unalienable rights. The Patriot Act is the thin edge of the totalitarian wedge. (con-speak) -- Foreign policy should focus on "exporting democracy" and economic freedom around the globe using free trade agreements. (Plain English) - Use U.S. military might to install puppet governments and expropriate the resources of less developed nations by forcing them to agree to allow foreign control under the euphemism of 'free trade'. (con-speak) -- Be skeptical about global warming science. (Plain English) - Ignore science and protect the interests of the petroleum and coal industries at any cost. (con-speak) -- Churches and social organizations are better than government at dealing with social problems such as homelessness and poverty. (Plain English) - Buy the loyalty of Evangelical demagogues with government grants. (con-speak) -- "Defense of marriage" and a belief that "the unborn child has a fundamental individual right to life which cannot be infringed." (Plain English) - Keep the yokels distracted with fairy tales about the end of civilization. > Scott Ayers isn't trying to sell conservatism, just discuss it... but, his (BELLINGHAM HERALD) blog does attract some of the local conservative 'true believers'. Another conservative commenter wrote: "...Republicans have us pointed at capitalism and the morals system that made our nation great." But gosh, I can't find anything great (or even palatable) about the Republican version of a moral system or the crony capitalism represented by pillars of Republicanism like Former Republican Congressman Duke Cunningham, Former Republican Congressman Mark Foley and Republican uber-lobbyist Jack Abramoff. 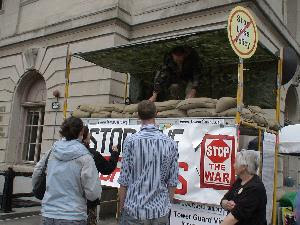 STOP-LOSS Vigil - Knappenberger on Democracy Now! Evan Knappenberger's Tower Guard Vigil is over, but his activism isn't. Iraq Vets Evan Knappenberger and Adam Kokesh were interviewed by Amy Goodman on Democracy Now! Evan talked a little about his experiences in Iraq and about the STOP-LOSS policies that are keeping many troops in Iraq after their enlistments are over. This morning Bellingham Herald Opinion Editor Scott Ayers (no relation to former Whatcom County Republican Party Chairman Bruce Ayers) was chronicling the sad condition of conservatives in Bellingham. It seems Bill Gorman's withdrawal from the Mayors race leaves conservatives with no one to vote for. What makes it doubly sad for Bellingham's conservatives is that Bill Gorman is a former chairman of the Whatcom County Democrats. 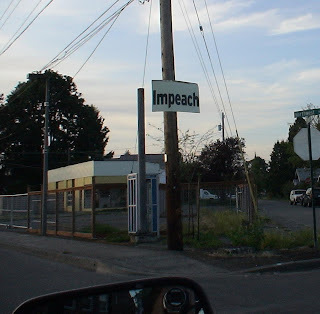 Scott wonders: "So what’s a conservative Bellingham resident to do now? Are there any candidates that can truly be called fiscally conservative or "business first?"" Evan Knappenberger's week long Tower Guard Vigil ended Friday afternoon. I spent some time out in front of the Federal Building each day of the vigil. I was there at various times of day and no matter what time it was, passersby were drawn to the tower and to Evan. Most who stopped to talk were curious, not really knowing what stop-loss was but sensing it was something they should know about. There were people who had heard about the vigil and made special trips to meet Evan and thank him for what he was doing. Many Veterans stopped to talk; Veterans of WWII, Korea, Vietnam, Operation Desert Storm and O.I.F.. All of them were supportive of Evan's efforts to educate Americans about the Pentagon's use of stop-loss as a backdoor draft. I asked Evan about negative reactions to his vigil. The people who stopped to talk and expressed a favorable view of stop-loss could be counted on one hand. There were a few people who shouted or made rude gestures from their vehicles. Evan observed that a common trait of those detractors was that they never spoke or made gestures while they were stopped by the traffic signal, but only when the light changed and they began to drive away. During the time I spent at the vigil, I heard a few (very few) shouts from passing vehicles, but whatever they were shouting was unintelligible because they had already gone through the intersection. I witnessed only one person make a clearly understandable disparaging remark. A youngish guy walked past with an angry look on his face. After he had completely passed the tower, he spoke over his shoulder; saying "why don't you trying serving before you criticize" and then hurried on down the street. Apparently he completely misunderstood the meaning of the vigil and who he was speaking at. In the Friday's edition of the Bellingham Herald there was a story about the vigil. In the online comments to the story was a bitter complaint that the article wasn't balanced because it didn't contain interviews with "Those who support our military stop loss program", but the commenter didn't suggest where to find such creatures. Evan's vigil wasn't about being anti-war or liberal or Democratic, it was about fundamental issues of ethics and fairness. No one who actually listened to what was being said could support the continued use of stop-loss to maintain troop levels in Iraq while most Americans are completely untouched. Evan completed his mission today!!! it was a huge success. hundreds of people in our little corner of the world now know about stop-loss. many have heard about it for the first time. for me it was a powerful week. my connection to people i knew before was strengthened and enriched and i met so many wonderful new people of good will. i will be able to look back at this experience on days i call my "no hope" days and draw the strength to go on. there he goes.....THANK YOU EVAN !!!!!!! 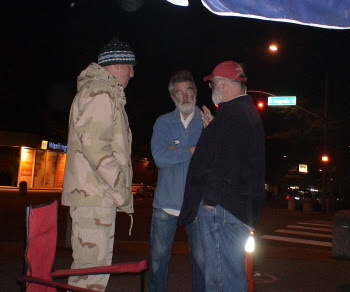 jpeg joined the overnite support team and snapped this (day 6) late nite picture of Evan talking with a couple of Vietnam Vet. Evan was interviewed by Peter B. Collins who was filling in for Thom Hartmann on Air America Radio (heard locally on am 1090 Seattle). There will be a Closing Ceremony for the Tower Guard Vigil during the regularly-scheduled peace vigil at 4pm at his tower in front of the Federal Building (Cornwall and Magnolia). Please join us in honoring Evan for his weeklong protest. WHEN: Friday, June 8, 2007 at 4 p.m.
Passersby are drawn to Evan's tower. They stop to read the signs and many ask "what is stop-loss?" because they had no idea our 'all-volunteer' military could force people to continue serving after their enlistment was completed. Iraq Vet Evan Knappenberger speaks about Stop-Loss. Evan Knappenberger talks about the purpose of the vigil. ...and seeing this sign on the way home was an added treat. 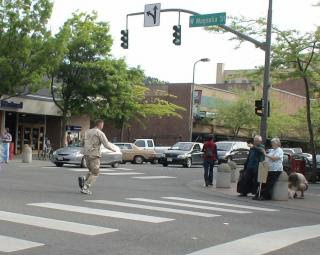 Nearly a hundred people gathered in downtown Bellingham, WA, (June 1) to hear speakers, offer support, and commend the efforts of Evan Knappenberger in his week-long vigil to call attention to the US administration’s STOP-LOSS and Inactive Reserve (Ready Reserve, or IRR) policies. i had the pleasure of meeting Evan today as he starts his 7 day Tower Guard Vigil . his courage and willingness to stand up gives me hope that, just maybe, we can wake america up to what is being done in our name. every day i search for hope and fight cynicism as i watch comfortable americans shop, overconsume and indulge in their favorite distractions. i often feel powerless to stop the devastation and injustice. Evan inspires me to continue to fight so those who come after us will have a future. Iraq Vet Evan Knappenberger introduces himself. Evan Kappenberger sends a message to his friends still serving in Iraq. Standing Tower Guard on a 6′ scaffold at the Federal Building in downtown Bellingham, Iraq Veteran Evan Knappenberger, 1st BDE, 4th Infantry Division, started a week-long vigil on June 1st to draw attention to the US military’s STOP-LOSS and INACTIVE RESERVE policies, which he submits are being used as a substitute for conscription in a political war. Bush and neo-con advisers have pursued there dreams of a neo-empire without requesting the reinstatement of the draft. Neither have they called on their loyal base to step forward and join the military. What Bush and company have done is to use STOP-LOSS orders and recalls of INACTIVE RESERVES to keep the ranks filled. This careless policy is slowly destroying the U.S. military. Bush's callous, inhuman policies are exacting a terrible price from the Troops and their families.